Its another awesome news for all Sun Cellular subscribers of broadband! Today, you’ll get to enjoy the most affordable Sun Unli Surf Promo. You get to choose from these unli surf packages that gives you non-stop internet surfing with SUN Broadband. These unbelievable Sun Unlimited surfing Promo Unli50 100 220 450 899 really suits your lifestyle yet fits perfectly within your budget. This Sun Broadband allows you to do more browsing, social networking, video streaming and even downloading. 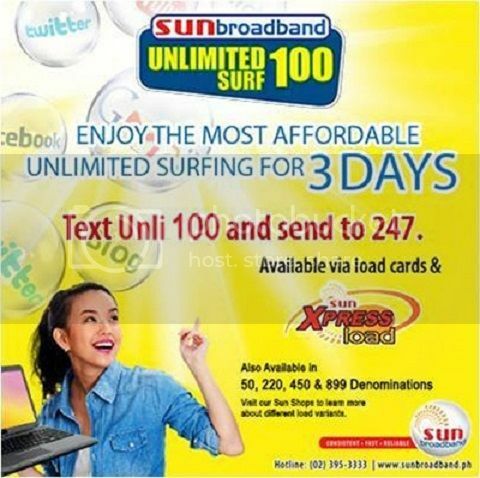 Sun Broadband subscribers can now enjoy Sun Unlimited Surf Promo for Sun Broadband. Choose from unlimited surf packages that will suit your budget and lifestyle. Stay connected to your friends and family and keep updated on your favorite social networking sites. See Below the procedure on How to Register Sun Unlimited Surf Promo for Sun Broadband. What are you waiting for? Load up your SUN Broadband with the Sun Cellular Unli Promo packages. Try it now! 9 Responses for "Sun Cellular Unlimited Surf Promo Unli50 100 220 450 899 Internet Broadband"
Is your signal in the area of Dela Costa Homes II, North Caloocan, Caloocan City strong? Coz I would like to avail your promo. Unlimited nga kaso napakahina naman ng signal, sayang lang din.. Di ako makanood ng youtube or even spotify connection..
i made an experiment with these. unli100=1st day 1.29gb limit, 2nd day 800mb limit, 3rd day 800mb. my unlisurf pb ang sun? verry disgusting and disapointed to globe 1day unli daw after 1 hr. ubos na supersurf50 langya mas ok pa Sun cellular kahit papano nkaka 1day. Why is not available unli100? ?